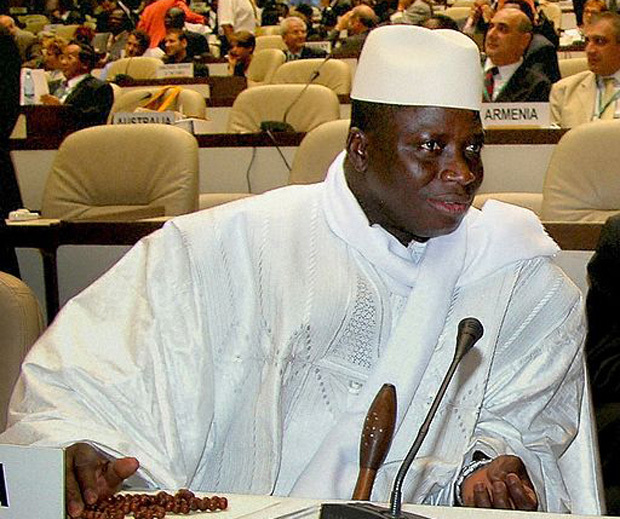 President Yahya Jammeh describes it as a "colonial legacy"
Gambia’s president Yahya Jammeh has said he will soon discontinue the use of English as his country’s official language, describing it as “colonial legacy”. The plan appears to be to make a local language the country’s official one, but reports have also emerged suggesting Arabic will replace English. Speaking at the swearing-in ceremony of the country’s newly appointed Chief Justice, Jammeh — known for his anti-western rhetoric and policies — said for the next “one billion years”, the British have “no moral platform to talk about human rights anywhere in the world”. Gambia gained its independence from the UK 49 year ago, and the president stated that the only British remnant is the English language. “We no longer believe that for you to be a government, you should speak a foreign language; we are going to speak our own language,” he emphasised. The move comes after Gambia withdrew its membership of the British Commonwealth in October last year, stating that it “will never be a member of any neo-colonial institution and will never be a party to any institution that represents an extension of colonialism”. The news has been met with opposition. Former diplomat Dr Momodou Lamin Sedat Jobe, now heading the pro-democracy group Gambia Consultative Council (GCC), told news site Jollof that the president’s latest statement is “yet another disappointment”, questioning its feasibility. “It is much easier said than done,” said Hamat Bah, leader of the oppositional National Reconciliation Party (NRP), in an interview with local newspaper the Point. He said the implications and ramifications would be huge and must be addressed before the change could be made. Demba Ali Jawo, a journalist and prominent political analyst, suggested that President Jammeh’s announcement was just a diversionary tactic to shift focus from the economic and social problems his government faces. He points out that a change of language would take much more than just mere anti-western rhetoric, arguing that “as our languages are not yet written, we need to develop a dynamic written form which has the capacity to accommodate the rapid technological development, including information technology”. He highlighted the judicial system as a sector where the switch away from English could be particularly complicated, and predicted that it would take much longer than President Jammeh’s own lifetime for Gambia to completely do away with the use of English.